The Haitian Revolution completely altered the perception of what was possible in the 19th century. Haiti’s independence, based on Black pride and autonomy, stoked fear in European and American leaders whose economies were dependent on Black slave labor. The power of Haiti was too powerful and so it was silenced and world leaders since 1804 have striven to make Haiti pay for what they did. In the 19th century, greed, violence and exploitation of slave labor combined to create massive wealth for a select few and a checkerboard of European and American territorial influence in the Americas. Few places embodied this unholy combination more perfectly than the French colony of Saint-Domingue, the wealthiest colony in the Americas. To the colonialists of the time, it seemed as if Saint-Domingue and the colonial system it represented could not fail. Therefore, when Saint-Domingue did collapse to give way to the nation of Haiti, it must have felt like the world shifted on its axis. Scholars such as Ada Ferrer, discussed how the reality of the revolution encouraged planters in Cuba to prevent such a revolution from occurring in their colonies, while slaves simultaneously used Haiti as a symbol of an impossible dream which became reality. This duality of expression represents part of the reasons why the imperial powers of the era collectively organized to silence the history of Haiti. Michel-Rolph Trouillot writes that the “Haitian Revolution thus entered history with the peculiar characteristic of being unthinkable even as it happened,” and it was this unthinkable revolution that could not occur again. However, despite efforts to silence Haiti, the story of Haiti as the first successful slave rebellion in modern history spread throughout the Atlantic world and left its most permanent and irrevocable mark on its closest neighbor: the Spanish colony of Santo Domingo. The history of the Dominican Republic does not exist without the history of Haiti, and this article explores why. Since 1810, residents of Santo Domingo were planning their independence from Spain. Historian Anne Eller writes that the aims of colonists seeking independence “were multiple and heterogeneous, a disparate collection of interests that reflected both the political fragmentation and desperation of the colony itself in the wake of several particularly difficult decades. Most significantly, they looked to neighboring revolutionary Haiti for help.” In other words, colonial leaders in Santo Domingo conceived visions of independence with the belief that Haiti was going to provide assistance. Indeed, the influence of Haiti on Santo Domingo was a living memory for many in the Spanish colony. In the midst of the Haitian Revolution, in 1801, leader Toussaint Louverture arrived in Santo Domingo, occupied the island and ended slavery, only for slavery to be reintroduced the following year when Napoleon invaded Santo Domingo. Dessalines invaded Santo Domingo in 1805 ending slavery, but the French and Spanish, eventually reintroduced slavery in Santo Domingo in 1809. Both Sybill Fisher and Anne Eller write that these events left a strong impact in the consciousness of Santo Domingo residents attempting to create a new nation, particularly slaves who navigated the space between being free and unfree in a region that “by 1809 was a devastated war zone on the brink of starvation.” In the decades to come, the situation would only worsen. In the midst of a possible French invasion determined to invade Haiti, Santo Domingo leader José Núñez de Cáceres declared the colony “Estado Independiente del Haiti Español” (Independent State of Spanish Haiti) on December 1, 1821, and on February 9, 1822, Cáceres gave the keys of Santo Domingo to Haitian president Boyer. Boyer reunified the island by abolishing slavery in Santo Domingo and redistributing land to former slaves. However European powers’ unwillingness to recognize the independence of Haiti, France’s forced $100 million indemnity on the island, civil wars in the province of Haiti and issues of land, former slaves, the Catholic Church (forced to give up land) and elites in Santo Domingo plagued Boyer’s plans of modernization in the island. Thus, the unification period of 1822-1844 between Haiti and Santo Domingo was one of grandiose promises and hard realities. The elite’s desire for modernity at the expense of peasant labor and imperial powers’ desire to prevent the island from succeeding thwarted the potential of what Haiti/Haiti Español could have been. This history of Haiti and Santo Domingo was not the story that I learned as a child. I am the first daughter of Dominican immigrants born in the United States. My family taught me that Haitians invaded Dominican Republic, murdered innocent Dominican children with spikes and that we always have to be vigilant against another Haitian invasion. However, the historical record is consistent with the fact that “above anything else Haiti wanted to prevent slavery from being introduced into the territory.” As Anne Eller states, there is a story of “voices of pan-island unity that have often been ignored.” What, then, happened to this pan-island unity? And why has is it been effaced in the historical memory of Dominican people, as evidenced by my parents? Scholars have written extensively on the concept of Anti-Haitian rhetoric in the Dominican Republic. 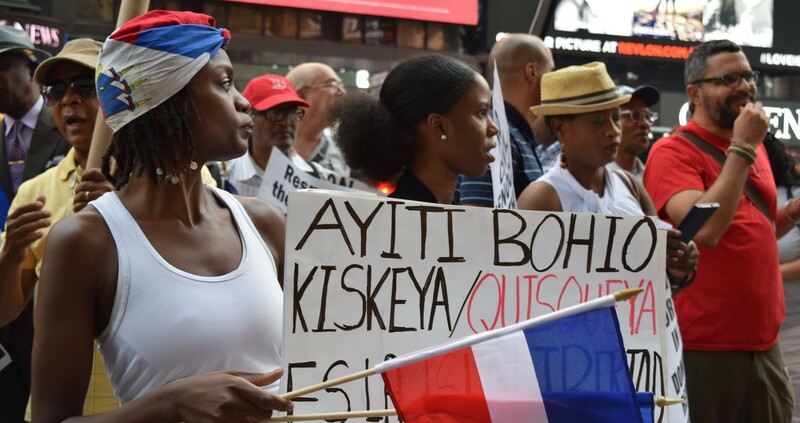 Many argue the rise of Anti-Haitianism and the development of an indigenous Dominican identity were integral to the creation of a modern Dominican state and identity in the 20th century. We also know that both Haiti and Dominican Republic were attempting to create definitions of statehood and modernity in face of overwhelming United States military presence in the island. By 1917, the United States Marines occupied both Haiti and the Dominican Republic. Historical knowledge tells us that during this time period, using the belief of Manifest Destiny, the United States was repeating this process of military invasion throughout Latin America. Therefore, what happened on the island of Española was not an anomaly. However, I would like to argue that due to the historical and symbolic role of the island of Española in the history of colonialism in the Americas, perhaps the invasion of the island in 1916 represented more than American expansion efforts. In order to understand the impact of the United States’ invasion of Española, we have to understand the historical and symbolic significance of the island. To many people of the Caribbean, the Haitian Revolution was a moment that represented the beginning of a Caribbean identity. What is often not discussed in relation to the Haitian Revolution is that the revolution occurred on the island that bore witness to the first colonial settlement in the Americas. Española was the first island to have experienced indigenous massacres in a search for gold for a foreign ruler. The first black slaves in the Americas were brought to Santo Domingo in July 1502, leading sociologist Silvio Torres-Saillant to label Santo Domingo as the cradle of blackness in the Americas. The first slave revolts occurred on the same island that would later give birth to the first successful slave rebellion in the Americas. What these events demonstrate is that the current division of the island was not predestined. Anthropologist Robert Adams wrote that even after the formation of the Dominican Republic, Dominican elites in Santo Domingo were determined to reform the border and rural region of the country based on concepts of “Hispanic” modernity due continued relationships between Dominicans and Haitians along the border. Elites, funded by the United States, were determined to end relationships between Afro-Dominicans and Haitians. However, resistance to elites lasted until 1962. Despite these state efforts, neither country is devoid of the influence of the other; they remained connected by the joint history that they share. Based on these events we have to ask ourselves if Anti-Haitianism in the Dominican Republic was preventable. Would the modernization projects of Dominican elites have succeeded if foreign powers hadn’t funded these projects? Would Dominican elites have been able to completely disassociate themselves from the Haitian government if global, economic powers such as the United States were not determined to silence the power of the Haitian Revolution in order to protect their own slave-owning societies? While it is difficult to prove such a connection without archival evidence, I do not believe that these events occurred in relative isolation from each other. I think it is of great significance that Anti-Blackness in the Dominican Republic is equated with Anti-Haitianism (in light of a history that proves that Anti-Haitianism in Dominican Republic was not inevitable). The emancipation that occurred on the island during its unification in 1822 represented the de-legimization of the system that brought suffering to millions of Africans and indigenous slaves, and enormous wealth to a select few. If slavery was eradicated on the island of Española, if Haiti/Haiti-Español was allowed to flourish as a country built on the principle of black liberation, then why should slavery exist anywhere else in the Americas? I think that is a question that countries such as France, Britain and the United States were not ready to answer. This combination of history and historical memory is a combination that Anti-Haitianism hides. Anti-Haitianism hides the joint origin of people in the island of Española. It silences solidarity efforts of the island. It silences the lives of former slaves and peasants who perhaps saw their futures within their communities instead of elite- governed states that marginalized their history in their quest to conform to American standards of modernization. Anti-Haitianism silences the role of imperial powers in preventing people from the island from creating sovereign futures, whether sovereignty was defined as two independent countries or a joint one. Most tragic of all, Anti-Haitianism is used to justify the brutal treatment that Haitians and Dominicans of Haitian descent face in the Dominican Republic. 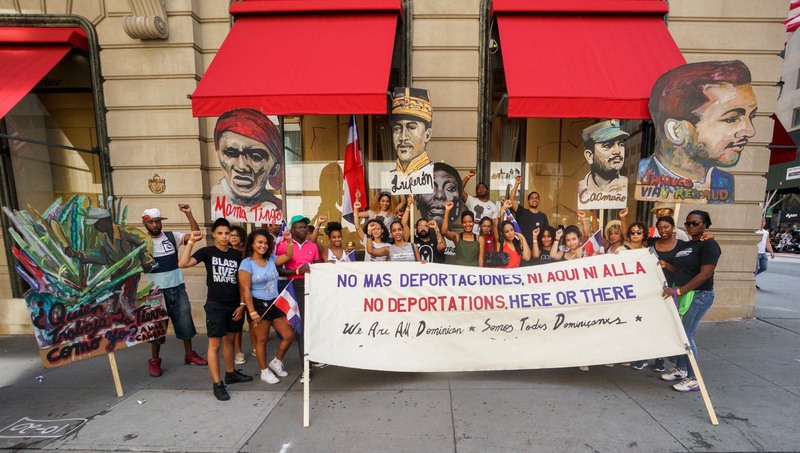 The forceful deportations of Dominicans of Haitian descent is much more than another racist political ploy on behalf of politicians that are not invested in the welfare of their country and its people. This law speaks to the very core of colonialism and slavery in the Americas and the legacy of mental colonialism among children of colonialism. In the Brief and Wondrous Life of Oscar Wao, fiction writer Junot Díaz wrote that the arrival of Europeans on Española released a fukú, a curse, unto the world. If Junot Díaz is correct and the landing of Europeans on Hispaniola released the fukú unto the world, what will it take to break the curse? If Hispaniola is our ground zero, is it also our place of salvation? Was the unification of the island our chance of salvation? Anne Eller writes that as the joint struggles of Española “are re-imagined, so will a more united and revolutionary history of Hispaniola.”  I would like to add that our salvation, if there is one, begins with claiming our souls within each other. If we who are born into pain and suffering; we who are born with names that aren’t ours; with lands that carry our blood, but that we will never know; if we who are born with an emptiness inside that is so great that no matter how much we feed it we seem to never fill; if we can find love within ourselves and each other, then maybe we can find salvation. Maybe the counter-curse is in the revolution we shall build with our souls and with our love. This is an important struggle because if Haitians and Dominicans can come together, it goes to show that our liberation from colonialism is not in having an independent country, or a free people. Our liberation is found within each other. If these two countries can recognize the joint history and struggle that they share, it would be the ultimate symbol of de-colonial love because it would mean the liberation of the colonial shackles in our mind. *In creating independent countries, both officials in Haiti and Dominican Republic used indigenous names as a method of claiming ownership over the land, legitimacy over their struggle, and sovereignty as a nation. Despite the difficulty of proving that these were actual Taíno names and the fact that Dominican officials coined the use of Quisqueya after obtaining independence as a way of differentiating from their neighbors, I use this joint as a way of asking, what if Ayiti-Quisqueya existed? Note: The period history of the island of Hispaniola between the 19th and 20th century is a very complicated one. It is a history beyond the scopes of this article. This piece merely covered a brief amount of historical material in an attempt to pose larger questions. I was born and raised in New York City until I was ten years old (excluding the year and a half I lived in Santo Domingo that I can’t remember as a toddler). My dad was a superintendent in the Bronx, before we moved to Miami, Florida. I completed my undergraduate degree in History as the University of Florida. I launched and coordinated the Latin@ Diaspora Project in the Americas at the Samuel Proctor Oral History Program at UF after graduating college. I am currently in my first year of graduate school in the History Department at the University of California, Davis. 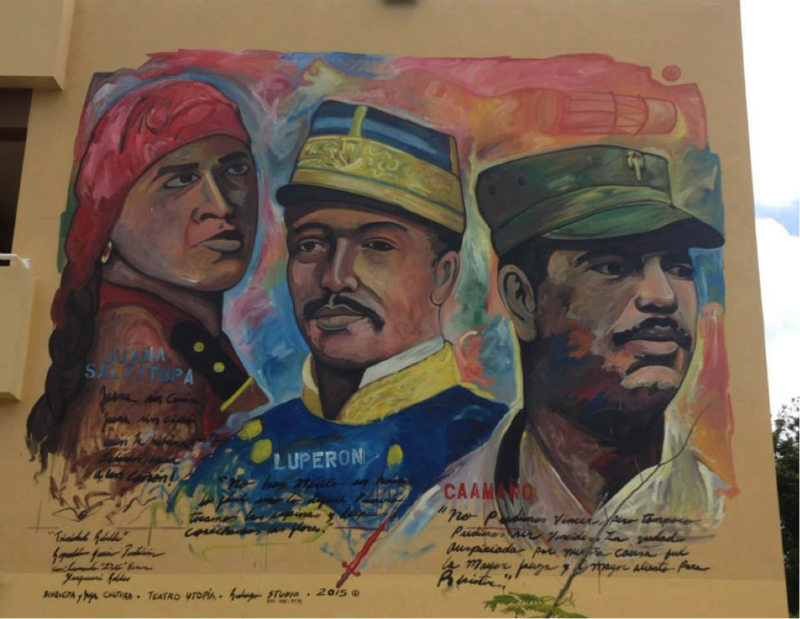 My work focus on the revolutionary period in the Dominican Republic. I am researching visions of nation imagined by Afro-Dominicans who lived the Trujillo dictator and elite Dominicans abroad, in conversation with the international solidarity Dominicans received in their quest to end Trujillo and United States imperialism in the country. But really, I am a Dominicana in the Diaspora (there is no Dominican oregano here), with a tremendous love for my family, my friends and my community. It is because of this love that I do what I do. I hope to put our histories in our schools and create community through the power of our stories. Ferrer, Ada. Freedom’s Mirror: Cuba and Haiti in the Age of Revolution. New York, NY: Cambridge University Press, 2014. Trouillot, Michel-Rolph. Silencing the Past: Power and the Production of History. Boston, MA: Beacon Press, 1995, page 73. Eller, Anne. “”All Would Be Equal in the Effort”: Santo Domingo’s “Italian Revolution”, Independence, and Haiti, 1809-1822.” Journal of Early American History I, 2011, 106-41, page 106. Fischer, Sibylle. Modernity Disavowed: Haiti and the Cultures of Slavery in the Age of Revolution. Durham: Duke University Press, 2004, page 131. 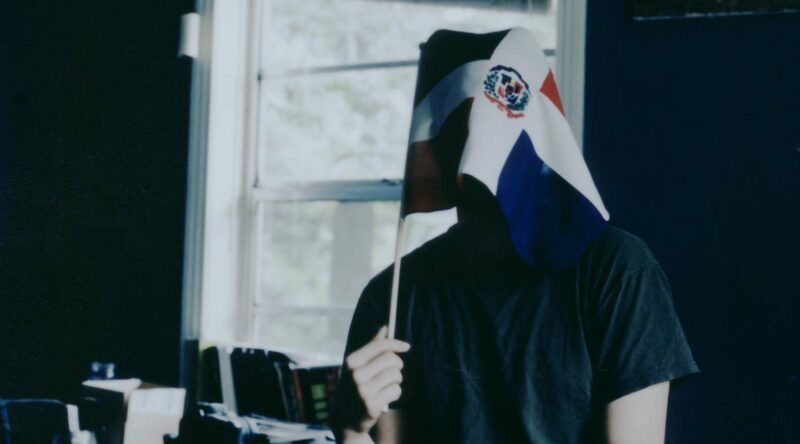 Fischer documents the rise of an indigeneity in Dominican Republic as a form of elites reconnecting with the colonial history of the island, in an attempt to be something different that Haiti. The use of the word “Quisqueya” which Dominicans stated was the original Taíno named of the eastern portion of the island became popular during this time. However, it is hard to determine what the original Taíno names of the island actually were. Torres-Saillant, Silvio. “The Tribulations of Blackness: Tribulations in Dominican Racial Identity.” Latin American Perpesctives, May 1998, 126-46, page 126. Clarke, Kamari Maxine, and Deborah A. Thomas. Globalization and Race: Transformations in the Cultural Production of Blackness. Durham: Duke University Press, 2006.